Abingdon’s full name is Abingdon-on-Thames due to the town’s position on the river. This makes for lots of scenic routes to stroll along the waterway and make use of the sweet pubs and eateries which overlook this peaceful stretch of the Thames. Many years ago Abingdon was the county town of Berkshire, although boundaries now place it in Oxfordshire, and the founding of the site as a settlement dates back to the Neolithic era (based on local archaeological finds). Indeed, the picturesque and now-quiet market square gives visitors a strong sense of the vibrant history of the town, when markets were held regularly over the centuries. There are several churches dotted around the square, including St. Helen’s, which dates from around 1100 and holds the illustrious title of being the second widest church in England, having five aisles and being only three metres wider than it is long. There is also St Nicolas’ Church, parts of which were built in 1180, near the museum. Abingdon’s county hall by the main market square, built in 1677–1680 reputedly by Christopher Kempster, stands on columns. It was once hailed as the “grandest town hall in Britain”. It now houses the Abingdon County Hall Museum and is operated by Historic England. Abingdon is well-situated for access into Oxford as it is only five and a half miles away and has reliable bus services running to and from Oxford city centre. 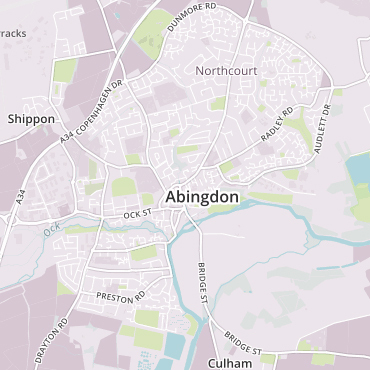 Abingdon sits adjacent to the A34 trunk road, linking it with the M4 and M40 motorways. Neighbouring Didcot is also only five miles away.